When comparing Oral Chelation Therapies, the question often arises – should one go with Liquid Chelation or Chelation Pills? There have been many studies done, and the resounding answer is that the advantages of liquid oral chelation therapy far outweigh a pill-based chelation therapy. One of the most referred-to statements is found in the Physician’s Desk Reference on page 1542. In this widely used medical reference book, it is noted that liquids can be absorbed up to 98%. 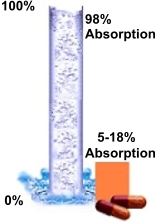 Where as it states the absorption rate of pills and capsules is 5% - 18%. This means that 80-95% of the ingredients contained in pills are excreted or eliminated from the body, which in itself can be very difficult on one�s system. When this is translated into monetary terms, for every $100 spent on pills, approximately $90 ends up being flushed down the toilet. In contrast, liquid forms of the same supplement (in this case, liquid EDTA), has an absorption rate of up to 98%. At Cardio Renew, we truly believe that our liquid products can offer fast and effective programs – and we back that belief with a no risk, no questions asked money back guarantee. In other words, try our 6 week program and if you�re not satisfied, we�ll refund the full product price � no questions asked � no need to fill out a form, just send it back to us � it�s that easy and straightforward! The world's most widely read chiropractic business magazine, "Chiropractic Economics" ran an article entitled "Liquid Vitamins: The Wave of The Future." The article was written by David Friedman, DC, ND, a certified Doctor of Naturopathy, a Life College graduate, noted educator, lecturer on nutrition, and board qualified chiropractic neurologist. My views on nutrition changed one day a few years ago when a patient came in and told me that she was having her septic tank repaired. She told me what was causing the blockage... hundreds of undigested vitamin pills, some of them with the brand names still readable. After hearing this disturbing news, I did some research of my own. I found in Tacoma Washington, 250,000 pounds of undigested vitamin and mineral pills are pulled out of the sewers every six weeks. In Salt Lake City, over 150 gallons of vitamins and mineral pills show up in their filters every month. The reason is due to the high metallic content of these pills. Metallic minerals like oyster shells, carbonates, oxides and dolomites have the consistency of crushed-up rocks, which our bodies were not designed to digest. Even those pills listed as "all natural" often have added fillers and coatings that inhibit absorption. The Physician's Desk Reference shows that vitamins and minerals in pill form are only 10 to 20% absorbed by the body. That means for every $100 you are spending on nutrients, you are literally flushing about 90% of it down the toilet. Because of this lack of absorption, companies must use mega doses of nutrients and this can cause a taxation on the kidneys. According to the National Advisory Board, 100mg consumed in a tablet form translates into a minute stabilized 8.3mg concentration in the blood. Nutritional drinks offer a 98% absorption rate because they bypass the digestive process and go directly into the bloodstream and into the cells within a matter of minutes. In fact, tests from Massachusetts General hospital have shown higher blood concentration of insulin by oral liquid application. Even injections will take the insulin 30 minutes longer to reach the same blood levels. Not only are liquid nutrients more convenient, they also allow those with irritable bowel syndrome, hiatal hernias and diverticulitis to take nutrients that may have irritated them in a pill or capsule form.